A view of our new home page. 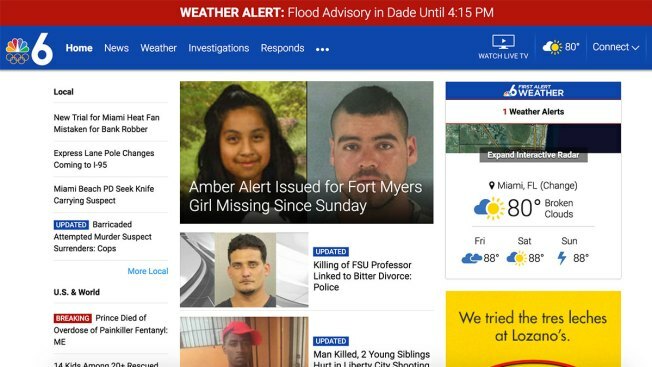 Giving you the information you need as fast as possible — that’s the guiding principle for the new NBC 6 home page, which has been revamped to highlight live video and the news you need to know right now. The new design on desktop and mobile web highlights all the live video available on the site — everything from newscasts to campaign speeches to the latest episodes of "The Voice" and "Blindspot." A revamped "This Just In" module provides information you need to know from our reporters and social media. And our interactive radar is now available right on the home page. A sleeker header that follows you across the site. It provides easy access to live video as well as convenient ways to connect with us. The header immediately highlights key sections like News and Weather, and when you hover over the “…” you can find all of the depth of coverage that our site provides. The “Watch Live TV” nav item serves as a hub for all of our live video, including a 24-hour-a-day stream of what’s on our on-air channel via NBC.com. The “Connect” nav item makes it easy to reach us. Use this nav item to submit breaking news tips, photos or videos, connect with us on social media or sign up for one of our newsletters. A live video bar that highlights important live video that is happening right now, including our on-air broadcasts, news conferences and special events. These live video bars will provide a link to the coverage as well as a few bullet points with more information. Interactive radar has been added directly to the homepage, allowing you to zoom in and out to track storms in your neighborhood and across the country. In times of severe weather, look in this area for the latest weather alerts and school closings. A “This Just In” section that is constantly updated with the latest news and views, especially on social media. News updates happen fast, so this will be an area of focus during breaking news situations and severe weather events. A “Quicknav” on mobile web that allows you to easily navigate between sections on your phone’s browser. Swipe left to see the main navigation items on the site. The “Quicknav” will follow you throughout the site for your convenience. We hope you like the enhancements we’ve made to the site and mobile web experience! Have comments or suggestions for future improvements? Let us know by clicking here.